Any attraction can make money fast if it’s running at capacity. The key is to run at capacity as often as possible. The more hours per week you run at capacity, the more money you make. For example, imagine you’ve bought a 30-suit Laserforce system. And assume that you run a game that lasts the recommended 7 minutes and 30 seconds. This enables you to run at least five games per hour and sell 150 tickets per hour. Given that, for common currencies, the average price per game is US$7, Euro 5 or AUD$7.50, you can now calculate the maximum amount you can earn per game. Generally, an average 30-suit site should have 1500-2500 players per week, though our busiest sites see more than 4000 players per week. Remember, the key to success is repeat play. Laser Tag FEC’s are stand alone laser tag centers where laser tag is offered as the primary attraction. For these centers, arena size is at least 400m2 and caters for 30-60 battlesuits. A Laserforce center can be an extremely profitable investment for you and we can give you guidance on selecting the right location and designing your playing arena. One stand alone Laserforce site has a database of over 300,000 members, a lucrative marketing tool. 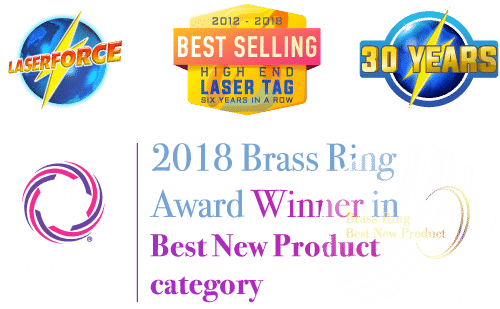 Everything about Laserforce is centered on repeat play and getting your customers to come back again and again for kid’s birthday parties, regular laser tag players, corporate team building events and team break ups. For stand alone sites we recommend the Gen7 Supernova system. It is the emerging order that people now expect Family Entertainment Centers such as bowling alleys, arcades, go-kart centers, trampoline parks and other FEC’s to offer laser tag as an additional form of family entertainment. Laserforce can be an excellent compliment to your range of experiences offered, designed to bring your FEC much added revenue. Laserforce is designed for repeat play, to bring more customers through your doors and keep them coming back for an experience unlike any other. Arena size is generally 200-400m2 and is suitable for 12-30 battlesuits. FEC’s can use the Gen7 Supernova or Gen7 Zap Tag system. Zap Tag systems in particular are designed for portable sites that do not require a membership system and can be easily run from the touch of a lap top. Portable sites are mainly inflatable or temporary arenas established for school fetes, carnivals, parties, cruise ships and more. Portable arenas are suitable for 10-16 suits. The pie chart shows the expenses breakdown for a profitable Laserforce site. The major expenses are wages (approximately 25 per cent of gross takings) and rent (which should not exceed 25 per cent of gross takings. Other expenses include electricity, insurance and advertising. An efficient site will achieve 15-40 per cent profit after management wages but before tax, interest and depreciation. The greatest demand comes from children aged 7-13, usually for birthday parties, and young adults aged 16-25, who tend to spend the most money. The game is also immensely popular with tourists, and corporate and social groups. With regards to gender, the greater demand does come from males, who comprise 66 per cent of players. However, a third of players are female. This exceptionally high rate of female participation is perhaps the most surprising thing about Laserforce and demonstrates its wide appeal. In fact, at age 15 the number of males and females is equal. We attract more females to laser tag by ensuring fairness of play, targeting our marketing to women as well as men, and creating more stylish-looking arenas and equipment. As a general rule of thumb you can plan on one battlesuit per 120 sq ft of space. For example, a high-profile downtown location might have 30 battlesuits for a 3600 sq. ft. arena, while a small town might need only 12 battlesuits. Laserforce centers are operating very successfully in arenas as small as 1,500 sq ft. Larger Laserforce centers cover in excess of 10,000 sq ft while the average size is 3000 – 5000 sq ft.
Generally, for stand-alone sites, the arena should occupy half the premises. However, you would also need space for your lobby, restrooms, offices, briefing room and armoury.